SIMADO GFX11E is a fixed cellular terminal specially designed for Emergency Applications in areas where GSM network is weak. A GSM desk phone can be installed where it is easy to get GSM signal, such as at a high end point and its extension can be installed at the location where GSM signal is weak, such as Elevators or underground areas. 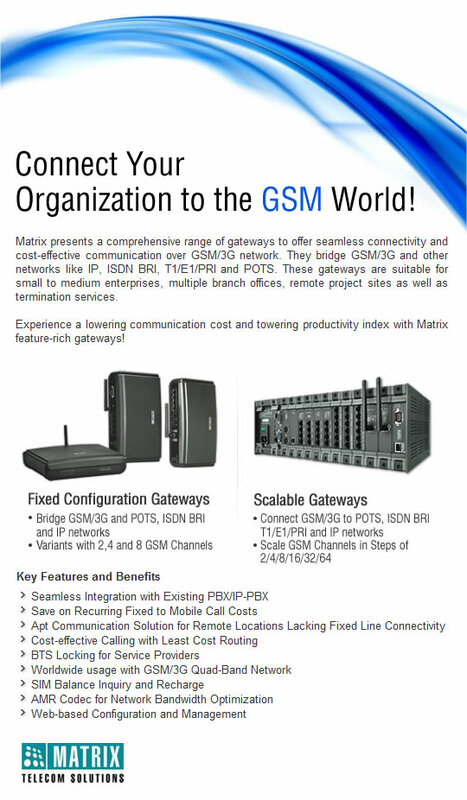 The extension can be directly used by simply lifting up the receiver and the call will be connected with the help center instantly. This GSM FCT can also be used in hospitals and senior citizen houses, where you face such emergency circumstances and people are unable to call for help during panicky situation. SIMADO GFX11E is a Fixed Cellular Terminal (FCT) with built-in battery back-up useful for Power Cut and Emergency Applications. During emergency situations, a caller can quickly connect with emergency service or a hotline number by simply lifting the handset. 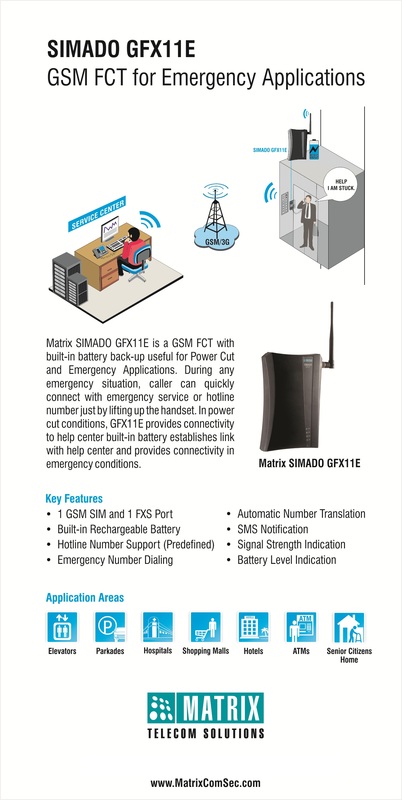 When power fails, SIMADO GFX11E with battery backup enables the user to establish a link with the help center. SIMADO GFX11E can be used in various areas such as elevators, ATMs, parkades, hospitals, shopping malls and senior citizen’s homes. During power failure, people stuck in critical conditions need emergency backup solution for seeking rescue from the help center. In this condition, SIMADO GFX11E with built-in battery can establish a communication link with the help center and emergency services. Victims can use the GSM fixed terminal connected with SIMADO GFX11E and hotline service or dial emergency help center numbers immediately. 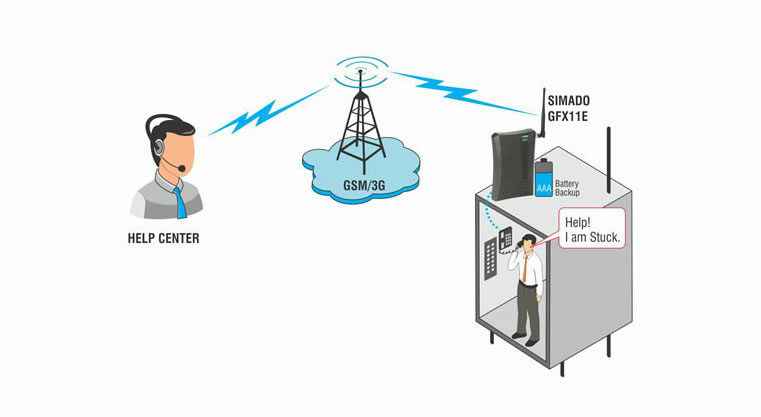 During power cut or low battery, SIMADO GFX11E sends SMS notifications to the service center. Emergency services such as Fire, Police, Ambulance and others can be reached even if the SIM is not present. Unit Weight 0.395 kg (0.87lbs.) Approx.